Huck “Huckleberry” Seed is a prolific tournament player. He has participated in tournaments for many years, and has made quite a comfortable living doing it. He is still competing in many of the big live poker tournaments, and also spends time playing poker online with Full Tilt Poker. A small town kid who has risen to compete with the biggest names in poker including taking down the ultimate prize in poker. Seed was born in 1968 and grew up in Corvallis, Montana, a very small town with a population of just 976. His family was a very athletic one. He was an excellent scholar-athlete, and his younger brother was, too. Standing at a height of 6ft 7in Huckleberry inevitably took to the sport of basketball and was a member of the 1987 Corvallis All-State Basketball team. This was just the beginning of Seed’s basketball playing. He went on to study engineering at Caltech college. There, he was a star on their team. 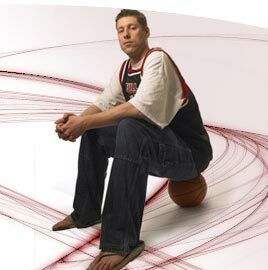 He was involved in a documentary about the sport that was shot in 2006 called Quantum Hoops. This is the trailer to ‘Quantum Hoops’ which featured Huck and was about his time playing for the Caltech basketball team which was filled more with academics than good players! In the meantime, Huck was studying electrical engineering. His maths skills and attention to detail gave him a good foundation on which to build his academics. However, a career in engineering was not to be. Instead, he decided to take a leave of absence from school. He left in 1989, with the intention to return. However after he started playing poker full-time he lost interest in school and never went back. 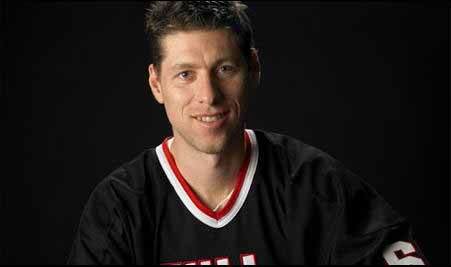 Seed made his first trip to the World Series of Poker in 1990. There, he tried his skills at the Limit Hold ‘em event and the Seven Card Stud Hi/Lo event. He did well, taking home fourth in both events. He got a taste of winning and was ready to come back for more. Huck Seed’s big breakout came in 1994. That year, he won the Pot Limit Omaha event at the World Series of Poker, taking home his first WSOP bracelet. While Seed was already making money playing in tournaments, the bracelet was, of course, a huge accomplishment. Things got even better in 1996, when Seed won the World Series of Poker Main Event, the ultimate prize in poker. This second bracelet came with a $1 million prize this time. It also came with a place in poker history and a certain amount of celebrity status. Every year, the thousands of players who arrive at the World Series of Poker to try and match his accomplishment see gigantic pictures of all the past champions hanging from the wall, among them is Huck Seed. Huck Seed has won 5 WSOP bracelets including the World Series of Poker Main Event – the ultimate prize in Poker! Seed followed this up with other WSOP victories. He had a sixth place finish after making a final table in 1999. He also won his third and fourth WSOP bracelets in Razz, one in 2000 and one in 2003. Lately, Seed is still making an impression on the poker world. He won second in FullTilt Poker‘s Poker After Dark. 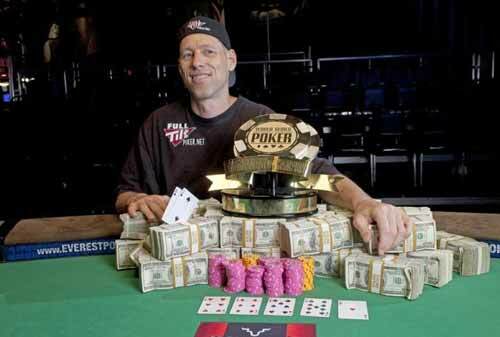 In the 2007 WSOP No Limit Texas Hold ‘em event, he placed 73rd for a cash of over $106,000. He also cashed at the NBC National Heads Up Poker Challenge. Huck may appear to be a quiet man when he is concentrating on his game. He rarely gives any indication of what is on his mind. Yet, at other times he makes wild propositional bets that keep the other players interested and amused. One crazy prop bet that Huck made was a $10,000 bet with Phil Helmuth that he could float in water for 24 hours, he lost that particular bet! In 2009, Huck gave an in depth interview to PokerPlayer magazine in the UK which looked at his career and background in detail. For Seed, the more pressure and money that is involved, the more relaxed you will find him. With live tournament winnings of $7.6 million and some major tournament wins, he is doing well. When he is not playing live poker, he spends a lot of time at cash tables and tournaments online at Full Tilt Poker. He is no longer sponsored by Full Tilt Poker, but still regularly plays at his former employers site. Want to Chat and Play Poker with Huck Seed?